Posted on July 16, 2018 by Greg Kaz. Have you been troubled recently with RV roof leaks? Many RV owners will eventually find that they have a leak in their roof that has the potential to cause quite a bit of damage to the RV if they do not take care of it sooner rather than later. It is also important that you understand some of the most common reasons that RV roof leaks happen in the first place. Understanding why and how they happen can often give you a better idea of how to prevent them from happening or repair them if they do occur. Caulk is used around certain areas to fix RV roof leaks, such as the vents or the skylights if you have them. This forms a waterproof seal around those areas, so the water cannot get inside. If you have a rack on top of your RV, these areas are typically caulked, as well. However, over time, the caulk will become old, and it can become brittle and even peel away. When this happens, it means that the water is going to start leaking in around those areas. You will want to check the caulk and reapply it on an annual basis, so you do not have to worry about this happening. Even though you do your best to make sure that your roof is cared for properly, there are certain types of physical damage that are nearly impossible to prevent. Having debris fall onto the roof, such as a falling branch, or even hail, can cause damage to the roof. You might not even notice that there is a problem with the roof unless you check it regularly. However, if a large branch has punctured even a small hole in the roof, it is going to cause some serious problems over time. If you are carrying items on your roof on the rack, the added weight could also cause problems for the roof, particularly around the areas where the rack connects to the roof. When you are inspecting the roof, be sure to check those areas, and add more caulk as needed. RVs are exposed to the elements for most of their lives. Over time, the effects of the sun, rain, snow, and the temperatures can cause problems with the RV’s roof. It will eventually get to the point where there are going to be certain areas of the roof that are weaker or that end up having holes and tears if you are not vigilant about roof care. It is a good idea to take some time to inspect the roof at least two to three times per year. This is true even of the newer RVs, but it is especially important when you have an older RV. If you notice any issues, you will want to remedy them immediately. Naturally, you want to make sure that you are doing your best to keep your RV in excellent condition, and that means you need to take care of those RV roof leaks as soon as you find them. 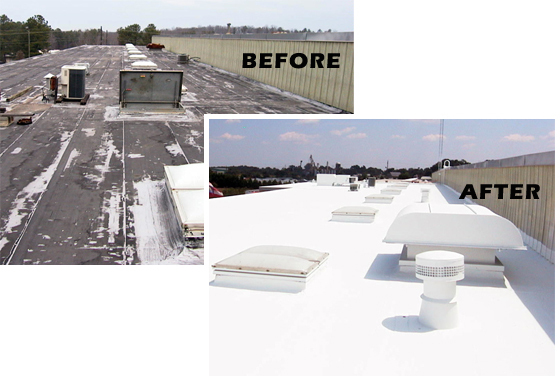 Add fiberglass patches to the roof to take care of the larger leaks, and then make sure you cover the roof with Liquid Roof. This is a liquid EPDM that can provide a waterproof barrier on the top of your roof to ensure you do not have to worry about leaks in the future. It is a fast, simple, and effective solution that is a good option for any RV owner to consider.